Next Sept. 30-Oct. 2, several of the world’s top skateboarders will compete for nearly $450,000 in cash and prizes, with $100,000 going to the winner of the street competition and $75,000 to the vert winner. But there might be more than green backs involved in the 1st Maloof Money Cup South Africa world skateboarding championships: the Street and Vert courses will be built near a diamond mine. The Maloof, that are now building permanent parks for their contests, have choose the location of the skatepark near a former diamond mine in Kimberley known as the “Big Hole.” It will feature a 15,000-square-foot concrete street course shaped like a diamond, a halfpipe billed as the biggest on the continent and a Mini Mega ramp. Maloof, who along with brother, Gavin, is considering moving the Kings to Anaheim, said it’s important that skate parks be left behind in the cities that host the various Maloof Money Cup events. 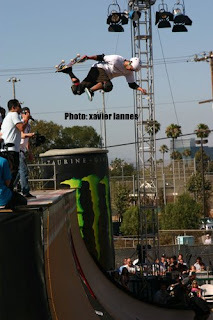 After starting with a single event in Costa Mesa, Calif., in 2008, the Maloof Money Cup has expanded to four contests this year — New York in June, a yet-to-be-announced U.S. stop during Labor Day weekend, South Africa and then back to Southern California. South Africa will be the first overseas contest in the series. “I think it’s a great opportunity for us to go international and not only bring something that’s very positive to the country of South Africa, but to be able to leave a skate park there and do something nice for the kids in all those areas,” Maloof said.